Cal Poly is hiring a librarian to work with their burgeoning open education programs. For those of us wondering what librarians should be (or are) doing with MOOCs, this is interesting news. A major research institution, investing in a dedicated position* for open education support–that’s pretty great. I haven’t seen other positions like this, but would be interested to hear about them if they’re out there. That’s…a lot of stuff. A few things in there seem a little tossed-in, like “Creative Commons” being somehow lumped in with copyright issues, as if it were a separate field of inquiry. But it looks to me as if the folks at Cal Poly are thinking broadly about where open education may be headed, and working to get out ahead. I’m not sure that I’d focus much of my Open Education Library Fellow’s time on MERLOT when s/he could be working on MOOCs (and I’m not sure if there’s a reason why the job names some names (Hathi Trust and Open Content Alliance) and not others (*cough*Coursera)…but overall, this is really interesting and encouraging. I hope that positions like this will gradually start to appear more frequently, that we’ll see universities recognizing the natural linkages between libraries and open education, and that libraries will start making these positions fully-funded and tenure-track. Because if you ask me, we’ve just seen the tip of the open education iceberg. 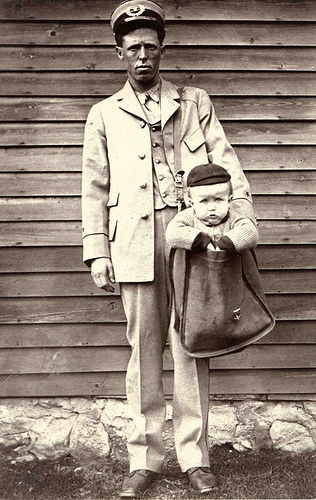 Interesting image of the day: Mailman with child in bag, courtesy Smithsonian.